Traffic simulation has become one of the most used approaches for traffic analysis in support of the design and evaluation of traffic systems. Although traffic flow models have been applied for almost a century to describe, simulate and predict traffic, digital computer programs to simulate traffic flow have been developed from the 1950s. With the increasing power of computers, simulations began to incorporate animation techniques. These animation techniques and visualizations allowed viewing the overall performance of a traffic system design while providing an excellent means of communicating the result patterns from a simulation model to officials, decision makers and the general public in a meaningful way. This work presents the design of an animation/visualization tool for road traffic simulation, which is independent (stand-alone/separate from a traffic simulator) and generic (that is, can visualize output data from any traffic simulator). This tool implements Google Maps as its background, thereby enabling users to view the animation of a simulation output on any target road. The source data for the animation is an XML file which holds vehicle information. Simulations of any system give users and decision makers an opportunity to appraise alternative strategies of the system before implementing them in the field. Digital computer programs to simulate traffic flow have been developed from the 1950s. The increasing power of computer technologies, the advances in software engineering and the advent of intelligent transport systems prompted traffic simulation to be one of the most used approaches for traffic analysis in support of the design and evaluation of traffic systems. The ability of traffic simulation to emulate the time variability of traffic phenomena makes it a unique tool for capturing the intricacy of traffic systems (Barcelo, 2010). Numerous research activities that have been carried out on traffic systems have concentrated on modelling, simulation and visualization/animation of rural and urban traffic by taking advantage of advances in computer technology, either to assess alternatives in traffic management or to assist traffic system construction in urban development. The physical dissemination of traffic flows can be specifically depicted using traffic flow models. By utilizing different traffic simulation models, one can simulate large scale real-world situations in great detail. Depending on the level of detailing, traffic flow models are classified into macroscopic, mesoscopic and microscopic models. Brief descriptions of these model types are illustrated below. This is a Postgraduate Thesis and the complete research material plus questionnaire and references can be obtained at an affordable price of N3,000 within Nigeria or its equivalent in other currencies. After payment, send your desired Project Topic, Depositor’s Name, and your Active E-Mail Address to which the material would be sent for downloading (you can request for a downloading link if you don’t have an active email address) to +2348074521866 or +2348066484965. You can as well give us a direct phone call if you wish to. Projects materials are sent in Microsoft format to your mail within 30 Minutes once payment is confirmed. We are trustworthy and can never SCAM you. Our success story is based on the love and fear for God plus constant referrals from our clients who have benefited from our site. We deliver project materials to your Email address within 15-30 Minutes depending on how fast your payment is acknowledged by us. 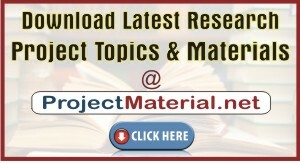 All research projects, Research Term Papers and Essays on this site are well researched, supervised and approved by lecturers who are intellectuals in their various fields of study. See full list of Project Topics under your Department Here! Using our service is LEGAL and IS NOT prohibited by any university/college policies. 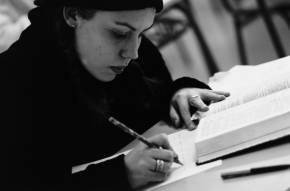 Our service is legal because, all institutions permit their students to read previous project, books, articles or papers while developing their own works. According to Austin Kleon "All creative work builds on what came before"....Read More!